So…I think there is only one topic of conversation that can be said. And no. It’s not the needless ODIs versus Australia which could have been used as perhaps a fourth test. And if it’s being really needy, a fifth test between the two giants of Test Cricket? Oh no, as long as there are some ODIs then we, as a cricket nation, are laughing. To be completely honest, the only positives were Bopara and Ian Bell on form and Samit Patel can’t field. You would think that would be a negative but it means there is more chance he won’t be in the team which ultimately…leads in to a positive. Going back to the first sentence. It is in fact, what was touched upon briefly, England versus South Africa on the July 19th. With the unfortunate retirement of Mark Boucher from International Cricket, ending on 999 dismals, we won’t be finding out the best wicket keeper batsman currently in International Cricket as Prior and Boucher were the main contenders. The most enthralling spectacle to be witnessed will be the front line bowling on both teams with the likes of; Anderson and Steyn, Broad and Morkel, either Finn or Bresnan and Philander. Personally, from what I’ve seen Philander accomplish with four 5 wicket hauls consecutively, he is the greatest threat in the South African team, especially with the English conditions. Philander bowls wicket to wicket and seams the ball away and in to the batsman deliciously tempting them to nick to the wicket keeper or bowl them. However, when coming across the batsmen like Strauss, Cook, Pieterson, Bell and Trott, which I find is the best Test batting line up, you can’t help but wonder how he will do and Pieterson will target him by stepping across the off side and whipping it away over Mid-Wicket which horrendously disrupt Philander’s length. 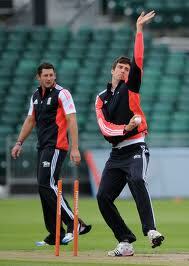 Finn or Bresnan? Debatable…very debatable but it’s time for Finn to turn himself in to a world class bowler as he could turn in to something of great magnitude in 4-5 years time. With the intensity and skill of the English batsmen already in the team, Bresnan’s batting wouldn’t be as needed as Finn’s bowling ability! By no means am I questioning Bresnan’s bowling. However, with the bounce, movement and destructive pace, 90 – 93 MPH, Finn is a much needed bowler which could trouble the South African batsmen such as Smith, Amla, AB De Villiers and of course the mere Jacques Kallis who’s a batsman which can take a few wickets, 88 – 90 MPH and 274 Test wickets and arguably the greatest ever all rounder.